The American Legion was chartered by Congress in 1919 as a patriotic, mutual help and community service organization. The Department of Virginia was formed at the same time with 91 local Posts with several thousand members. Today the Department of Virginia is comprised of 17 Districts containing 212 Posts with a total membership of over 33,500 Legionnaires. March 15, 1919 Members of the American Expeditionary Force convene in Paris for the first American Legion caucus. National organization committee sent to America from France by the Paris Caucus. 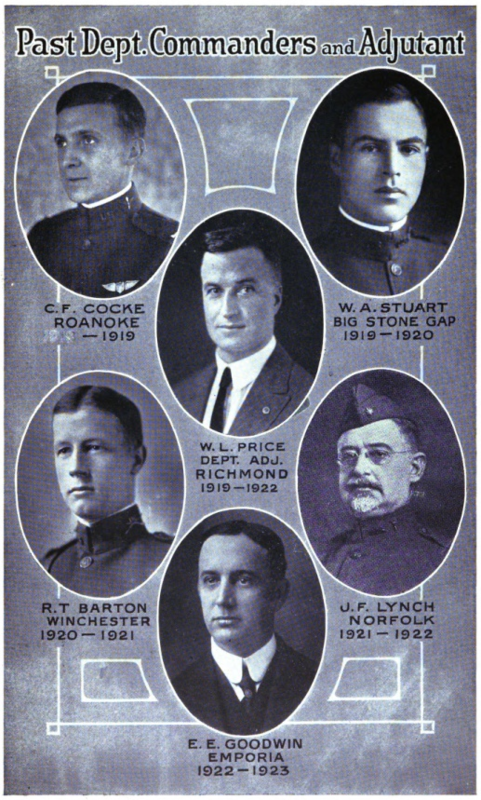 The First State Convention in Virginia was held at Roanoke on October 6th and 7th 1919. The first official delegation representing Virginia at the first permanent National Convention held in Minneapolis. The 5th Annual Convention culminated 4 years of hard work.